Opportunity Enterprises services, such as Secure Shred, Clean Team, Simply Amazing Market and JobSource, not only provide opportunities for clients to grow and develop, but also help OE connect with the community. For more than 50 years, Opportunity Enterprises has helped individuals with disabilities forge new paths toward amazing achievements. OE services, such as Secure Shred, Clean Team, Simply Amazing Market and JobSource, not only provide opportunities for clients to grow and develop, but also help OE connect with the community. “OE is OE because of the community we live in,” says Ellen DeMartinis, OE chief executive officer. 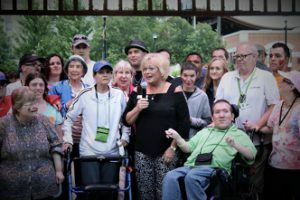 She addresses clients and their families at the organization’s 2017 Summer Celebration. 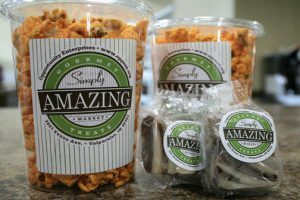 The Simply Amazing Market provides adults with disabilities a platform to build skills and meet community members while offering sweet and salty treats to shoppers. “These individuals make our popcorn, fudge and Bavarian nuts,” says Jennifer Fine, OE retail director. “Depending on their skill set and comfort level, they provide customer service, food production, product packaging, and gift assembly. JobSource partners with approximately 100 businesses in Northwest Indiana to connect clients to workplaces. “For more than 25 years, we have been placing and supporting qualified individuals with disabilities in a wage range of careers,” says Kathleen Parks Savich, director of OE’s JobSource Community Employment. Her team works to place clients in a variety of roles from entry-level jobs in food service and assembly work to professional positions in restaurant management and teaching. The job placement program not only assists individuals with disabilities, but also helps professional individuals who may be affected through an injury or illness. “The program allows clients to serve, earn a paycheck and contribute back to the community,” Parks Savich says. Assessing clients’ skill sets while fueling their passions and preparing them for employment are the initial stages of OE’s JobSource program, which also assists with job training. “We spend a lot of time getting to know the clients up front – their skills and passions. That matching is key to our 97 percent job retention rate,” Parks Savich says. Austin Blackman, 27, began participating in the JobSource program nearly three years ago and landed at Strack & Van Til in Valparaiso as a utility clerk. His position includes duties such as organizing shelves, sweeping and bagging groceries. Austin’s mother, Tammy, says he has found a connection to the community that is evident when they’re out and about and run into people who know Austin from the store. Monday through Friday, Austin Deavers, 22, arrives at OE ready to take on what the day has in store for him. DeMartinis sees OE’s success as branching out from a strong, supportive network.